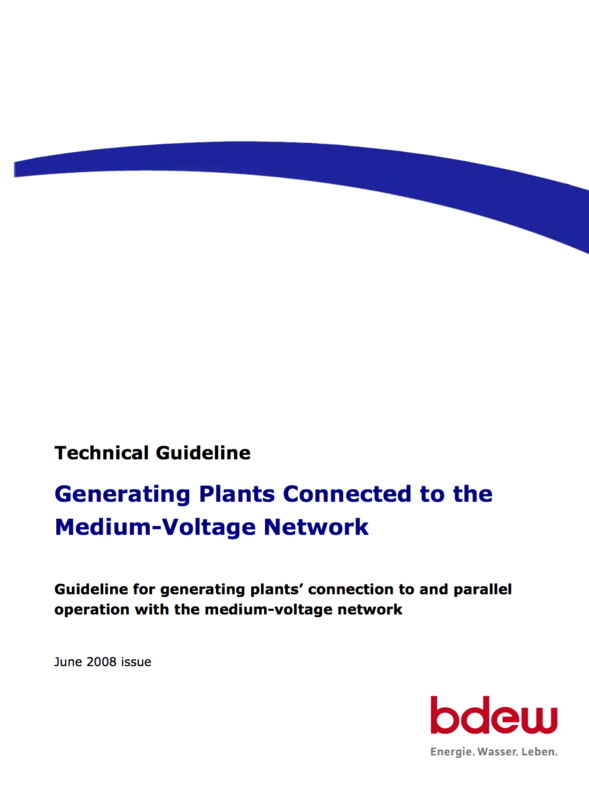 The present guideline summarizes the essential aspects which have to be taken into consideration for the connection of generating plants to the network operator’s medium-voltage network. Thus, they shall serve as a basis to the network operator and to the installer in the planning and decision-making process and provide important information on the plant operation to the observer. This guideline complements that for low voltage and high and extra-high voltage which takes the particular characteristics of the different voltage levels individually into consideration. The distinction of the guidelines into voltage levels has turned out to be reasonable as the specific requirements are too disparate to be combined within one guideline. This guideline shall apply to the planning, construction, operation and modification of generating plants (wind, hydro, photovoltaic etc.) which are connected to a network operator’s medium voltage network and operated in parallel with this network. It shall also apply if the network connection point of the generating plant is located in the low voltage network, while the junction point with the public network is located in the medium voltage network. This refers e.g. 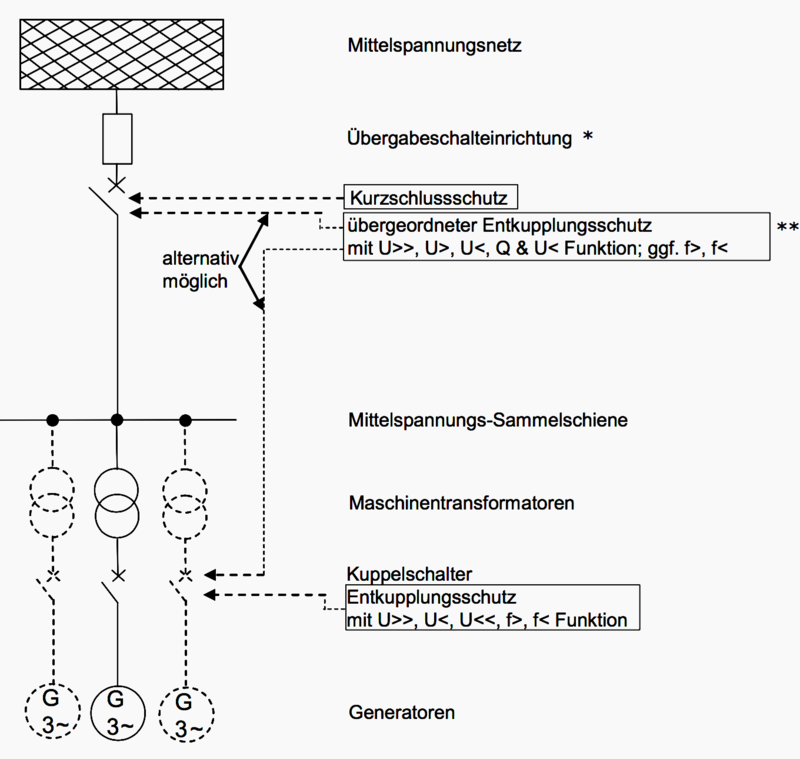 to generating plants connected to a low voltage network which is linked with the network operator’s medium voltage network through a separate customer transformer, and which no customers of public supply are connected to. For generating plants whose network connection point is located in the medium voltage network but whose junction point is located in the high or extra-high voltage network, the relevant technical connection rules shall be applied. 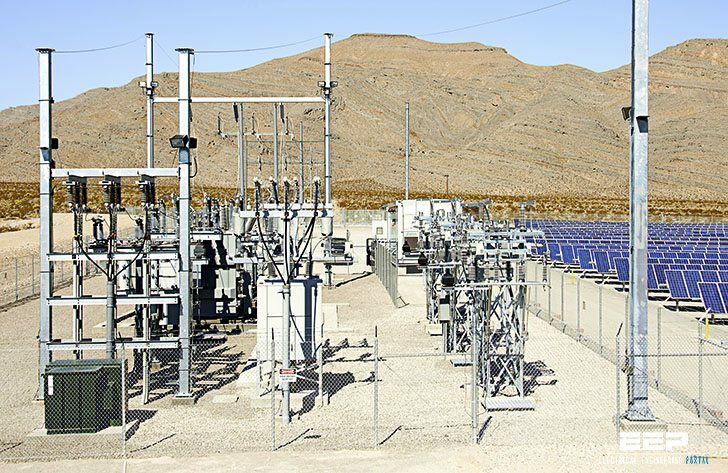 For generating plants having both their network connection and their junction point in the low voltage network, the VDEW guidelines on generating plants connected to the low voltage network shall be applied. A generating plant may be composed of a single generator or of several generating units (e.g. wind farm). The electrical energy can be generated by synchronous or asynchronous generators with or without inverters or by direct-current generators (e.g. solar cells of photovoltaic plants) with inverters. The requirements of this guideline can also be met by the connection of ancillary apparatuses (such as e.g. stabilizers, etc.) which are then an integral part of generating plants.